Biopic on the life of eccentric but much loved Jewish mathematician, Paul Erdős. Born in Hungary, 1913, to two mathematicians and showing his genius from an early age, he lived an uprooted life, travelling continually between university campuses where he lectured and developed groundbreaking mathematical concepts with anyone who inspired him. He cared little for personal possessions and took only as much of a wage as he needed to pay for his expenses, donating the rest to some charitable cause. He took his worldly belongings with him in a single suitcase and maintained a conflict with “God,” throughout his life, referring to Him as the “Supreme Fascist” (SF) and creator of “The Book” – a conceptual tome of the most beautiful mathematical proofs of the universe. Fueled by amphetamines and with his mother in tow, he did 19 hours of mathematics every day and spoke in his own version of the English language. He often accused the “SF” of hiding socks and Hungarian passports. 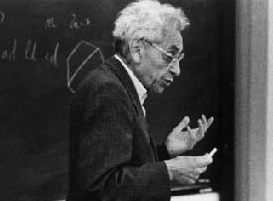 Mathematicians around the world would queue up to collaborate with him and he would often develop different mathematical concepts with many professors at the same time. In the wake of his death his influence is still apparent. Mathematicians still clamber for the lowest “Erdős Number” – a measure of how closely you collaborated with the genius. Kayfabe Films Ltd. is currently in negotiations with Paul Hoffman, author of the definitive Erdős biography, “The Man Who Loved Only Numbers” and whom has expressed great interest in being involved.